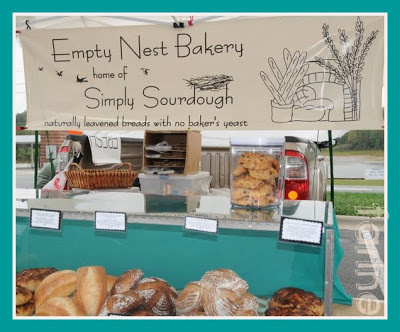 If I had to choose three words and three words only to characterize Kathy Andrews from Empty Nest Bakery in Hillsborough, NC, (and that would be a great pity because there is so much to be said about who she is and what she does), I would pick: “creativity, talent and determination”. Not only is she an accomplished baker but, in her other life, she is the chief designer for Storybook Metals, an ironwork business owned by her husband, George Barrett. 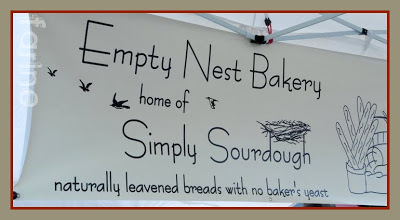 No slouch himself, George, a blacksmith, functions as Empty Nest Bakery’s self-avowed “sous-chef” in his own other life. Talk about teamwork! …and her hand-mixed and hand-shaped sourdough miches looked like smaller versions of the six-pounders my great-grandmother used to bake every two weeks in southwestern France (not that I ever saw any of these loaves or set eyes on my great-grandmother for that matter but my Dad described them and her so often that the images are imprinted in my mind). …and on the day of my visit, the figs and pears that went into the tartlets came from the trees which surround the house. Kathy keeps a liquid starter (that’s where the wild yeast comes from) with an hydration rate of 80%. Since she bakes on Friday, she takes it out every Thursday and feeds it (with flour and water). Once the mixing is done, she feeds it again and it goes back to the refrigerator until the following week. 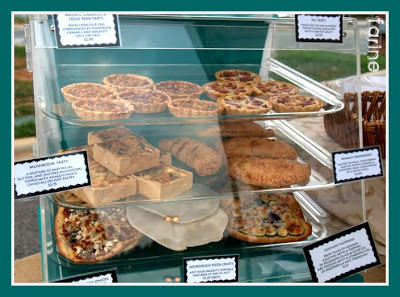 Almost everything is homemade at Empty Nest Bakery, including the bakery itself which Kathy and George built in an attached porch, replacing the existing screens with windows, refinishing the walls, building furniture and, often, retooling equipment bought second-hand, except for the big mixer and the ovens which are brand-new. 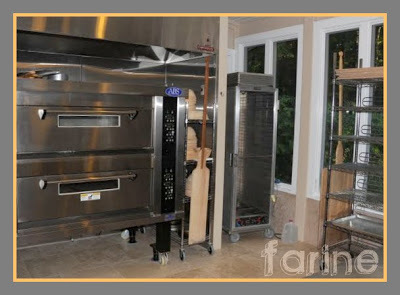 But for about four years, before the porch was changed into a gorgeous home bakery, Kathy baked 85 to 100 loaves every Friday in her two home ovens. 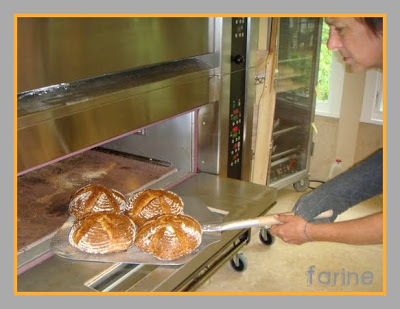 Each oven could only handle three “bâtards” (football-shaped breads) or four boules at a time and since the heat was inconsistent, each of these loaves had to be turned at half-time. 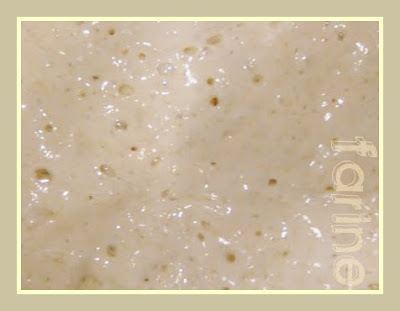 As dough doesn’t wait, she had to do her mixing by increments, staggering it so that the ovens would be available when the bread was ready to go in. It took many long hours (even without taking into consideration the innumerable rustic pastries and savories that Kathy was also baking) and an extraordinary level of determination but she did it! And George helped. But they didn’t and they now lend the bakery an undeniably professional allure. 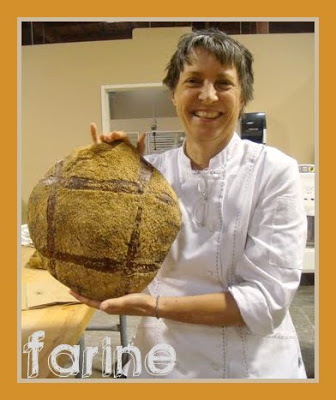 How do you get from being a home baker who bakes for her family to a professional baker who sells on a farmers’ market? Well, in Kathy’s case, what did it was an attack of the empty nest syndrome. 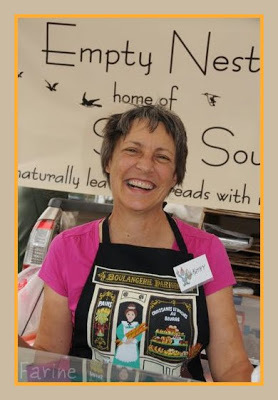 She had been a Nancy Silverton aficionada and a serious baker for years and was quite content to bake for her husband and their four kids. But the kids grew up as kids tend to do. One by one, they left the house and all of a sudden she was left with only two mouths to feed and dancing fingers which itched to mix, shape, score and bake. There was no way George and she could eat all the breads she wanted to create. 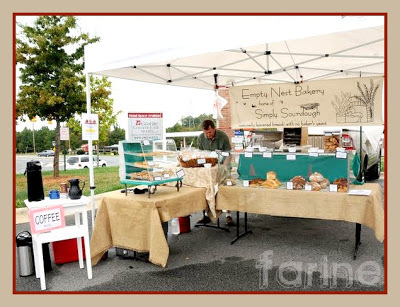 So one day, without even notifying George of what she was about to do, she went and registered with the Hillsborough Farmers Market (which takes place once a week on Saturday in the Hillsborough Home Depot’s parking lot) and just like that, Empty Nest Bakery came into being. When George came home that evening and heard the big news, he was flabbergasted. His reaction was : “Okay, I understand that’s what you need to do and I will support you. I will come help you set up the first few times but after that you are on your own. As you know, my Saturdays are for flying” (George is a fervent amateur pilot). 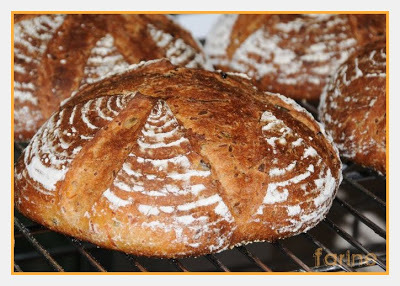 “Fair enough”, replied Kathy, “bread is my thing and I’ll manage”. That was five years ago and George has yet to voluntarily skip a market. Just like Kathy, he is hooked. Like her, he loves meeting new customers or chatting with the regulars. 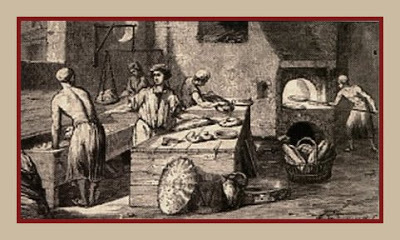 As aptly put by Steven Kaplan in his magnificent book, Good Bread is Back: A Contemporary History of French Bread, the Way It Is Made, and the People Who Make It, “like a sort of societal gluten, sources of bread constitute networks of sociability that structure daily life”. 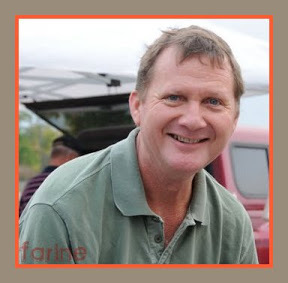 Kathy says that being part of the Hillsborough Farmers’ Market has given them both of them a deep sense of community and one only has to watch her and George interact with their customers to understand that indeed, beyond the business relationship, they perform a social function. They anchor the client in space and time. They give him or her a sense of belonging, the sense that someone indeed notices when they don’t show up and wants to hear whether or not they went on a trip or were doing poorly or were too busy with kids or grand-kids to get out of the house. Someone cares about what they like and will try to provide it for them. 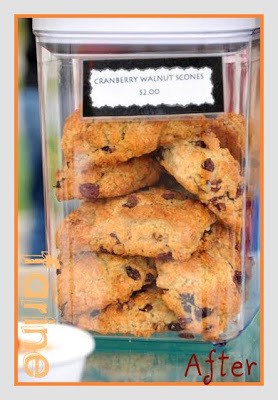 For instance Kathy doesn’t always bring scones to the market but on that particular Saturday an elderly couple who had been away for a couple of weeks was expected back and George reminded her they always liked to have a scone with their coffee. So she baked a batch. 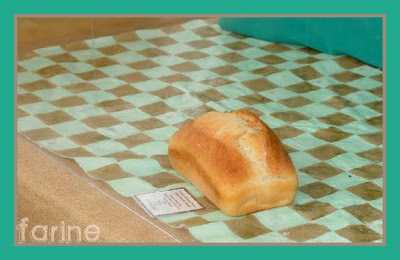 Now let’s say that, just like me, you came to the market on this fall Saturday and stopped at the bakery for a chat and a bite. What struck your fancy? 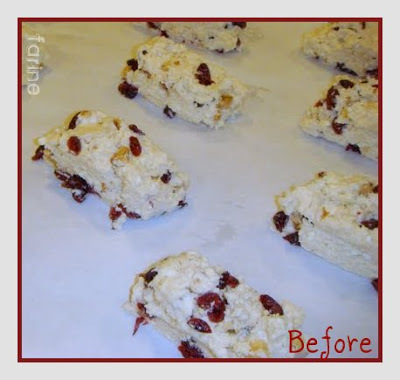 One of these tender cranberry-walnut scones? A big chocolate chip cookie? 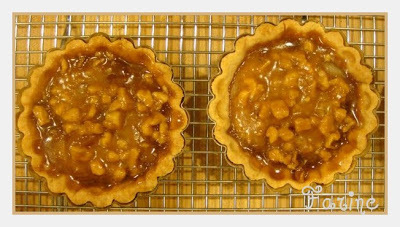 A scrumptious pear caramel tartlet? 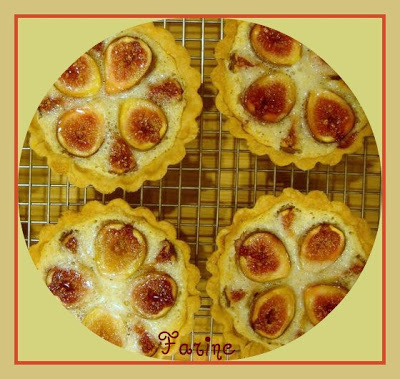 One of the afore-mentioned fig tartlets? 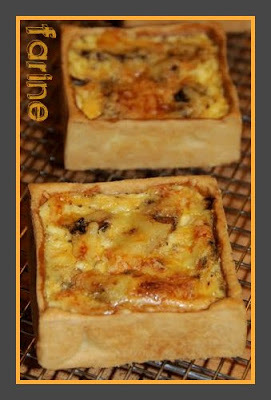 Or if you are more into savories, maybe a mushroom quiche? 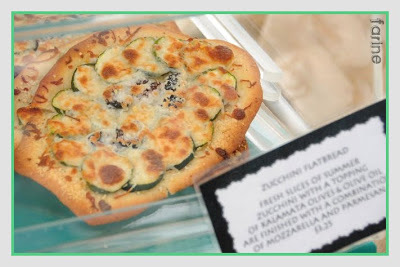 Or a flatbread? Some crackers? 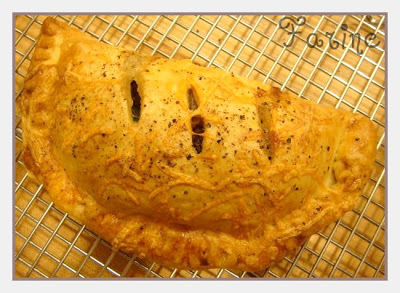 An empanada? 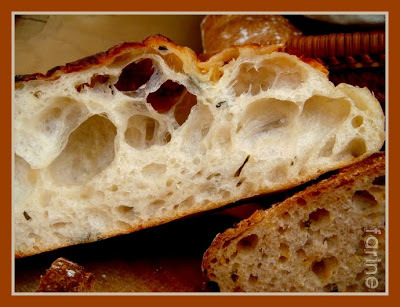 Or maybe, like me again, you came first and foremost for the bread. 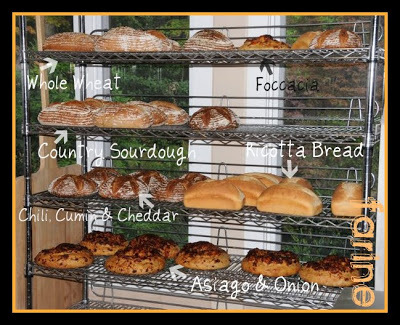 Then you had your pick of six different loaves: whole wheat, herb & garlic foccacia, country sourdough, ricotta sandwich bread, chili, cumin & cheddar and asiago & onion. I tasted all the breads and they were very good. 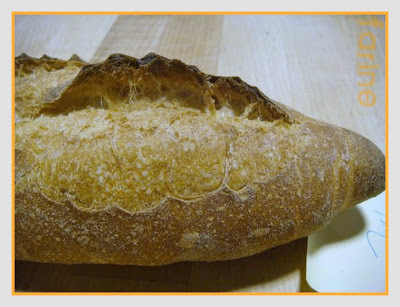 I tend to gravitate towards whole wheat and I loved that particular loaf but the Asiago cheese one was hard to resist. Like a child who tastes the jelly until there is nothing left, I found myself coming back to it quite a few times! It is moist and fragrant and very popular. 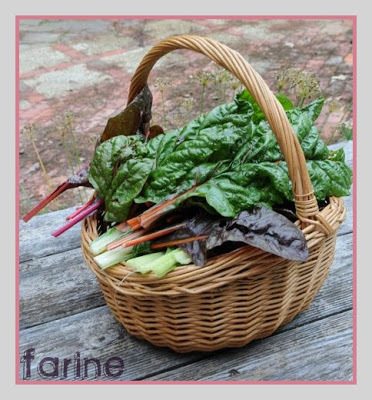 So popular in fact that Kathy agreed to share her formula with Farine readers. If you are interested in seeing her make it and/or in making it yourself, please click here. When asked where she imagines taking the bakery in the future, Kathy says that she wouldn’t be happy doing production baking. Her reward is the customer response. It spurs on her own growth. 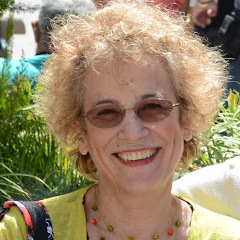 She considers it an honor that the customer chooses to spend his or her dollar on her products and a privilege that she thus has an opportunity to explore new tastes and to artfully present them. She doesn’t see herself as having a goal but rather a pursuit which will change with time. 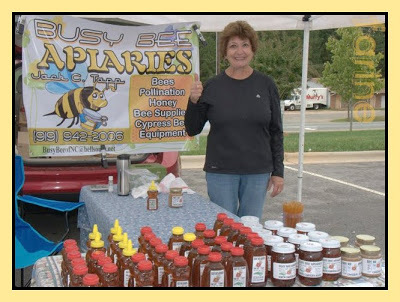 When the economy and the market improve (she produces much less these days than in previous years), she might hire an assistant and pass on her knowledge and passion. When baking is no longer fun, it will be time to stop. Meanwhile she’s in for the ride and so is George. Good luck to both of them! 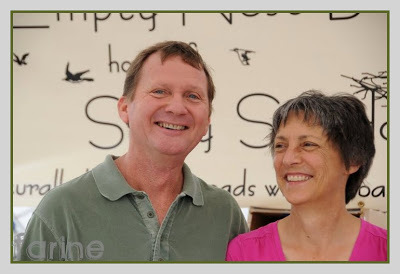 What a lovely story and an inspiring couple! How I wish I lived nearer so I could attend their market regularly! Wow! How come I never knew about this place when I lived in NC?! 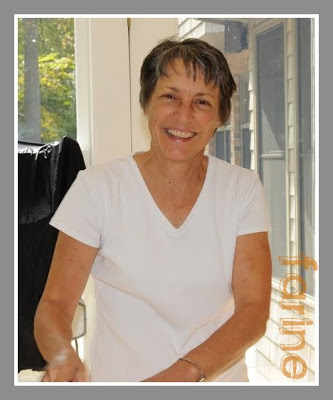 I love this "Meet the baker" thing you do! I thorougly enjoyed this story – beautifully told with great pictures! Thank you! Thank you for sharing an interesting story. I just marbled and admired interesting people like Kathy and George who put their talents and passions into action. I wish I live nearby them so I could her helper for free.